Rear view with the unit open. This one has a detachable HDMI cable so you can disable the built-in LCD and hook it to an external source. Headphone jacks are something often requested that I often forget to include. Not this time! Now you can play LAIR discreetly without disturbing others. The shape of the main air vent is a direct result of me watching my “Iron Man” Blu-Ray too much. It also kind of has a “ying yang” look and – like most of my stuff – uses the number 42 and the Golden Ratio whenever possible. The new stylish black look allows it to collect as many fingerprints as the original PS3! Now how much would you pay? Operators are standing by (in seats). Front view. You can see the Blu-Ray slot, more air vents and USB connectors. I can’t wait to get an Xbox 360 Slim. You know they’re coming. I went into Best Buy at opening the day the PS3 Slim came out and bought one before they were even put on the floor and took it apart 1 hour later. Same thing’s gonna happen with the Xbox 360 Slim. Largest part is the LCD screen so it dictates everything else. In the above sketch I’m figuring out the minimum extra space the case needs around it while still having screw fasteners and stability. But much like the windshield in a car, the LCD provides much of the stability itself. Layout of the 4 buttons (volume up/down power & eject). As you can see, things like buttons & vents are not just haphazardly slapped into the layout. A lot, and I mean a LOT, of time is spent making sure everything is aligned, spaced and positioned in a harmonious way. This makes the layout pleasing on a subconscious level, I believe. Yet MORE drawings where the air vents, buttons and “ying yang” swoosh are being aligned to each other. There is also the complication of not being able to put certain things where you want them because of components inside the case, so I have to work around that as well. If I do it well, you won’t notice. Side view determining the depth / walls of the case. Computer drawing of all the sketches. This shows all the components. For routing, these files are “taken apart” and put through the CNC machine piece by piece. 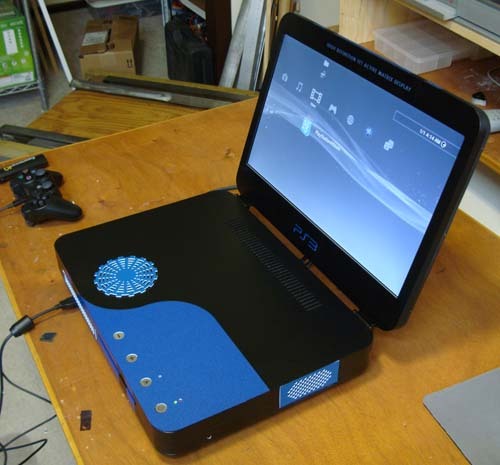 For more in-depth coverage of how this unit was put together, check out the Original PS3 Laptop “Making Of”. This is awesome. I loved the idea when you created the first one but this one beats it. Especially since you have included the headset jack and hdmi out capability. Does this just run on a power cord or is a battery built in as well? How much would you charge to create and ship one of these?? So……who’s buying it? Or did you just make this hoping someone would grab it? What does it cost you to machine the cases for these projects? AMAZING every time! Awesome job ben sony should hire you as a hardware engineer because you seem pretty skilled at it. Who the hell would want to play Liar in the first place? 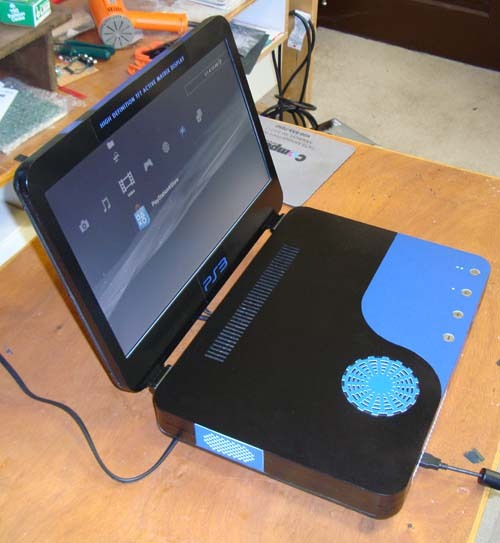 Pingback: Wireless Internet Laptops - Can I network to wireless laptops without anything else? I would be interested in buying this puppy. Hit me at my email if you are selling it or point to an ebay auction. Thanks, excellent work. how about a xbox 360 laptop? A keyboard would have been nice imo. Pingback: Can I use an Xbox 360 Wired Controller on my Windows Vista lap top? This is bloody brilliant! Are there any for sale? Pingback: Where can I buy cute, fashionable laptop cases? Pingback: Can I use my laptop as a bluetooth keyboard? Heh. 360 laptops just aren’t as cool, that’s why. They’re big, chunky, and any games anybody wants to play are on the ps3 anyways. This is a good one, but where is jetpack? not good until jetpack inside. Well done. The bright blue looks fantastic against the black. 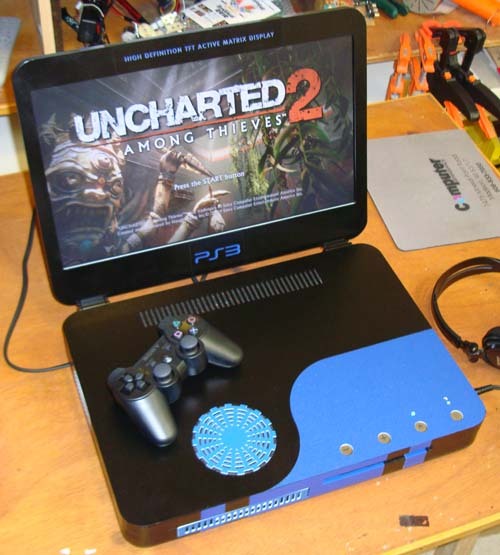 Pingback: [Video] [LOL] PS3 Slim Laptop 2: Ben Hack schlägt wieder zu mit Playstation3-Notebook mit 17-Zoll-Screen und HD | TechFieber | Smart Tech News. Hot Gadgets. would it be possible to include that chatpad somewhere for web browsing and the facebook features? 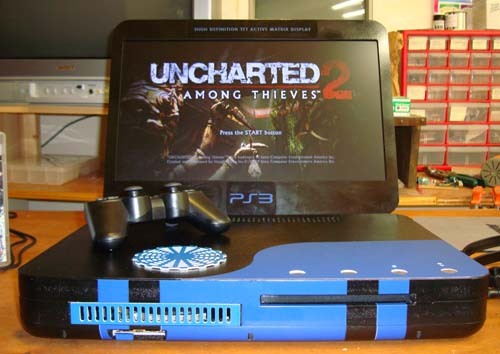 that would be a “true” PS3 laptop combo. wish I had some of those mod skills. i would love to buy this or pay you to have one built for me how do i go about that?? I am interested in buying one. How may I go about that? so how much would you charge to make one for me ? I feel XBox is much better than google .. 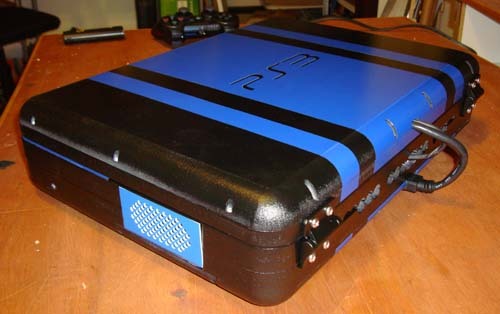 Ever since i saw your video’s i always wanted to make one of these, but really do not have any time to build this so can i please buy that ps3 slim off of you; money will not be a problem, please just write me back because i was dreaming of the day someone will make one of these and it was a bigger dream to even have this in my possesion, so if it is not a problem with you, can we make a deal for me to have this? When a problem was discovered in Sony’s PS3 consoles, the company’s official response was lacking. 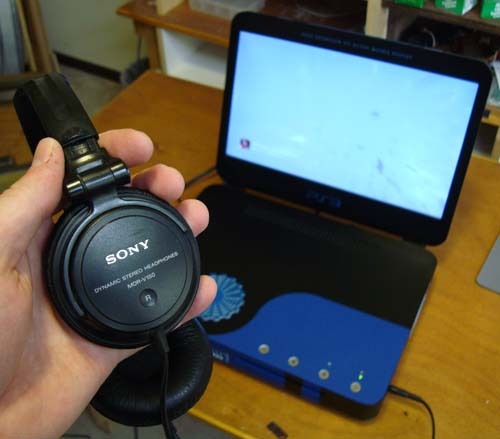 Sony never tells you that most of the problems you encounter on your PS3 console is actually repairable by yourself. 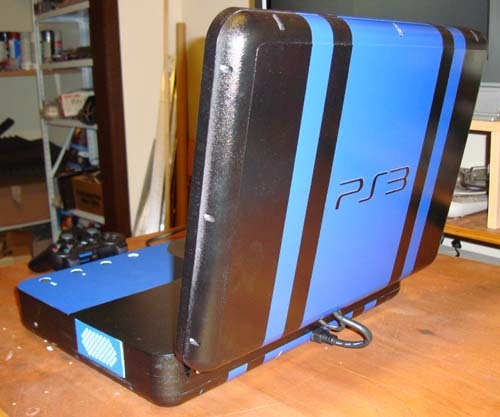 I live near Madison WI, and was wondering if you would consider doing this to my PS3? If so, how much would it cost me? Would it be possible to get something like a laptop keyboard on the unit without making it too much larger? I’ve been wanting to do this for a long time but unfortunately I don’t have the skills required to do it. I understand people are always asking you to do this, but most of them are probably pretty far away. I saw in a video interview you did that you’re in WI, so it wouldn’t be that far. If you’re willing shoot me an email back, if not I understand. I am interested to buy one is 6000-8000 dollars ok? Mail me. Just wanting to know, if we send you the ps3 and all that how much will this cost? You, my friend, are a God. I love you. Ha Ben I was wandering if you could mod my ps3 with a USB and get me to 15 prestige on black ops and have the god mode speed hack UFO hack and unlimited care package hack for me on call of duty black ops please I am willing to pay $200.00 just tell me where you live to send the ps3 to you and send it back as soon as you mod my ps3 for black ops. i am sure you get asked this all the time, but about how much would this cost? This is A MUST HAVE!!!!!!! You need to work for SONY. It’s funny because I found out about this because some actually posted one of your pics on an auction site, stating that they were auctioning it off. Of course it got deleted (I’m glad)…but how much would something like this cost? Me and my husband would want one! Hi!! Ben My son love your show on ps3 laptop and xbox 360 laptop i wonder if you can make a ps3/xbox 360laptop in the same case if so i will like to see that and buyit and give you a xbox 360 and ps3 so u can buildit and if you need anything from me write back to me because i love to see that on your show before i go and have my knee done thank you for all the things you made on your show. Love the way that new ps3 slim laptop was designed, really fits with my other gaming gears.. So have u tried putting a ps3 and xbox360 together? That would be pretty cool. It might be easier to do it in laptop form. I would desperate like to purchase a PS3 slim laptop. How do I get one? … how much? its must have, i mean im poor and still willing to pay for somethin like this… and do you plan to have backwards compatibily for a future design? Whow ! 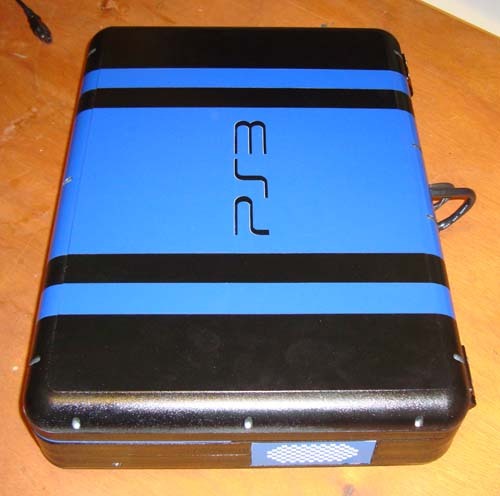 i´m a ps3 fan ! 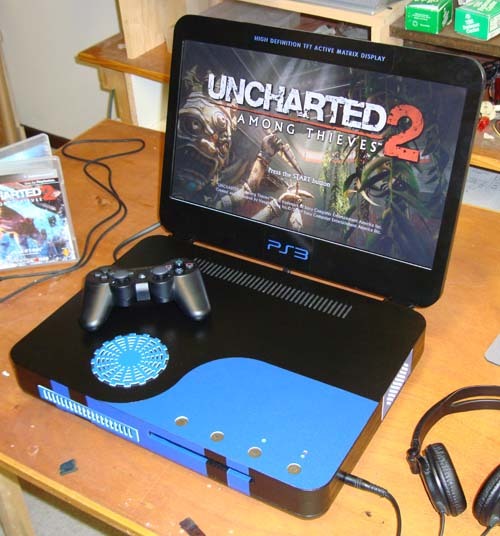 this ps3 note is wonderful !!! Where i can buy one ??? great ! How much does this cost? I’ll buy it!